Times have changed at Microsoft: according to GitHub it now ranks number one for open source contributors. Not so long ago company executives were actively opposed to open source, but since the arrival of CEO Satya Nadella in 2014 the organisation has changed its stance. 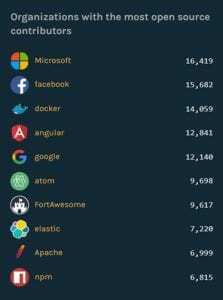 The GitHub 2016 Octoverse report stats show that Microsoft has 16,419 contributors, ahead of Facebook in second place with 15,682.